With the government’s gender quota in peace process events continuing to fall far short, the Karen Women Organization has announced plans to help bolster women’s participation at all levels of peace events. “All women who take part in township, district and central level political movements should be participating in every phase of the peace process. Women should actively join the peace process in order support a sustainable peace. We are now sharpening our political capacities so that we can get involved in every step,” said Naw Dah Dah, vice chair of the KWO. 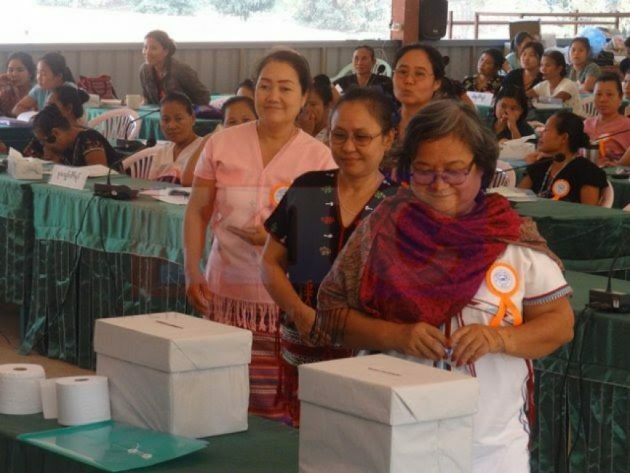 The KWO announced its aim to rebalance gender representation in the peace process during its 7th congress at the Le-wah Camp in Hpa-an district, Kayin State. Women’s rights activists have long warned that by excluding women’s voices from the current peace talks, the negotiators risk undermining the long-term success of any peace deal. Despite a government commitment to a 30 percent quota, women’s involvement in the peace process has thus far been limited to superficial tokenism. According to the Alliance for Gender Inclusion in the Peace Process, of the 48 members on the Union Peace Dialogue Joint Committee (UPDJC), only three are women. Naw Dah Dah told KIC its past time for the arrangement to change. Human rights activist Naw Ohn Hla welcomed KWO’s aim to help propel a more inclusive peace process. KWO’s eight-day congress involved around 150 women representatives. The participants reviewed the successes, weaknesses and challenges faced by the organization over the past four years. They also amended KWO’s constitution, and laid out future projects for the next four years. The 7th congress re-elected 45 senior central committee members and 11 central executive committee members, while Pado Naw Paw Day Toe was chosen as the chair and Naw Dah Dah as the vice chair. Naw K’nyaw Paw was elected general secretary, while Naw Tarmalar Saw and Naw Sae Sae will now serve as deputy secretaries 1 and 2, respectively. The KWO was established in 1949 to help with development and relief activities in refugee camps. The organization has since expanded to include promoting women’s participation in community decision-making and political processes.